Rc No 2877/APSSA/CMO-Media/ Dated 06-11-2017. Sub: ‘Dial Your SPD’ programme on 08 November 2017 during 3-4pm - discussion on issues and challenges in elementary education — Inform and promote to utilize the opportunity by students and parents. 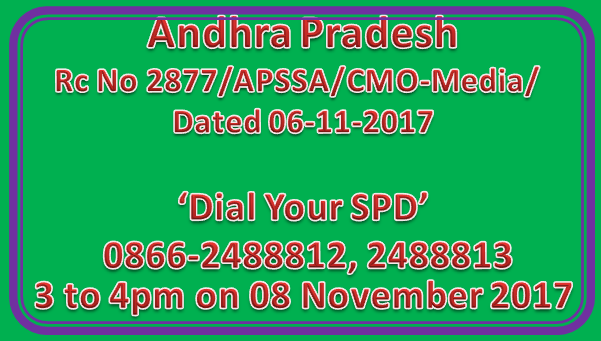 This is to inform you all that ‘Dial Your SPD’ programme will be held by state project office on 08 November 2017 during 3-4pm. This is for discussion on issues and challenges in elementary education such as distribution of free uniform, infrastructure, quality of teaching, utilization of funds at school level, conducting of SMC meetings etc. Students studying elementary education in government schools in the state and their parents can dial directly to SPD in 0866-2488812, 2488813. Hence, you are instructed to inform all the MEOs, HMS, CMOs and thereby teachers to aware the students and parents to utilize the opportunity to bring the Issues directly to the notice of SPD from 3pm to 4pm on 08 November 2017. The recorded programme will be broadcasted by All India Radio Vijayawada ‘A’, FM Rainbow (102.2) on 09 November 2017 at 9am.